The word Saguaro is taken from the Indian vocabulary. The letter G is silent, and is thus pronounced as “suh-wah-ro” or “sah-wah-ro.” It is, however, formally referred to as the carnegiea gigantea, which was a named after Andrew Carnegie. Because of how it is pronounced, there are also people who give an alternate spelling for the word: “sahuaro”. While it is not the formal spelling, you should at least know that people are referring to the same cactus. You’ll see this across all kinds of media, being used by people, businesses, and other groups. Like some cactuses, the Saguaro bears flowers. In fact, the saguaro cactus flower is the state flower of Arizona. This is not to be mistaken for the state tree of Arizona, which is different. The Sonoran Desert covers about 120,000 square miles of land falling within Arizona and California territories. Half of the state of Sonora, Mexico and a huge part of Baja California are also included. More importantly, this is the only place where the saguaro cactus can be found. They can’t survive in places above 3,500 feet because they can’t stand the cold. This doesn’t mean that saguaro cacti can’t be raised in the home. You can purchase seeds sold at many gift shops in town and with proper care, it can grow in a typical home environment. They take very long to grow, though, so you probably won’t live long enough to see them get taller. The Saguaro starts to grow arms after it reaches a height of 15 feet, which usually takes about 75 years (they really do take long to grow). Contrary to what most people say, there is no known limit as to how many arms the cactus can grow. If you see a saguaro with a lot of holes on it, it means that a Gila Woodpecker has drilled several holes on it to drink the water stored inside the cactus. This doesn’t hurt the cactus much, since it uses scar tissue seal off the hole. Most people will see the saguaro as thirty feet tall with around five arms. The National Park Service, however, has reported that the tallest known saguaro was roughly 78 feet tall. That one was more than 200 years old. As mentioned before, these cacti have no limit to the number of arms they can grow. With the tallest being 200 years old, they have a lot of time to grow as many as 50 arms. That doesn’t mean that they’re the largest cacti in the world, though, since there are many of cacti varieties that are found in the Mexican and South American deserts that are bigger than the saguaro. You know how they say that water is the secret to smooth skin? Well if you touch the outside skin of the saguaro, you’ll find it to be really smooth. This may have something to do with the fact that the cactus is capable of storing tons of water within its own body, all thanks to its ability to expand and absorb water. No, it doesn’t mean that they’re not family-oriented. The saguaro simply has very shallow roots. They have a tap root that doesn’t go beyond three feet long. The other, smaller roots stretch out a bit longer, contributing to the plant’s overall stability. These roots also tend to wrap around rocks. Saguaros will have flowers once per year, mainly between May and June. They don’t bloom at the same time, though, but a lot of them will bloom over a few weeks. The flower blooms open in the evening and will last until the following midday. A few of these flowers will open every night through the month. These flowers secrete nectar that tastes really sweet. Saguaro flowers are usually about three inches wide and it composed of a wide cluster of petals that have a creamy white shade. In the middle of the cluster is a huge cluster of yellow stamens - notable the most you’ll ever see in any other cactus flower. Although cacti are often avoided by other animals, the saguaro’s flowers still attract all manner of flying creatures including birds, insects, and bats, which go for its sweet nectar. The pollination process begins as these creatures move from cactus to cactus. #13: They Bear Fruit Too! The cactus also bears its own fruit, which is about three inches wide from fully ripe. Each of these fruits would have about a thousand seeds which can be distributed by dessert critters that feed on the fruit itself. This is how saguaro cacti spread in the desert. Woodpeckers don’t just drink the water from the cactus; they sometimes nest on them too. But they’re not the only ones, as owls, flinches, and martins commonly inhabit these cacti as well. Some hawks are even known to perch on these plants because it’s a great place to spot their desert prey. 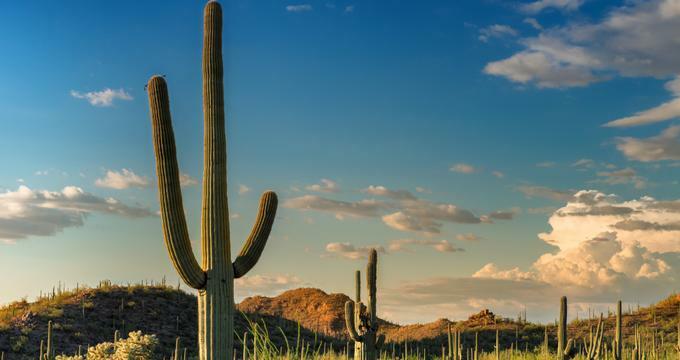 The saguaro is constantly being threatened by a number of factors. For starters, they are quite susceptible to desert lightning strikes during the rainy seasons. They are naturally in danger of getting root rot as well. As if those weren’t enough, humans have a habit of using them as target practice, making the animals that naturally inhabit in the cacti, abandon them, which also affects their survival. With all these dangers, it’s easy to assume that they’re endangered, but they don’t seem to be declining in numbers. Of course, it doesn’t mean that you should do whatever you want with the plants. In fact, it’s illegal to dig up a cactus without a permit. This also means that you have to be wary of individuals selling the plant. If they don’t seem to have a permit, you’d best not buy from them.